This time, a dog story! It’s been a week of edits, and not on a story with dogs in it, so it took a ‘like’ on my Facebook page–for the guinea pig excerpt–to remind me I promised to post a dog excerpt. 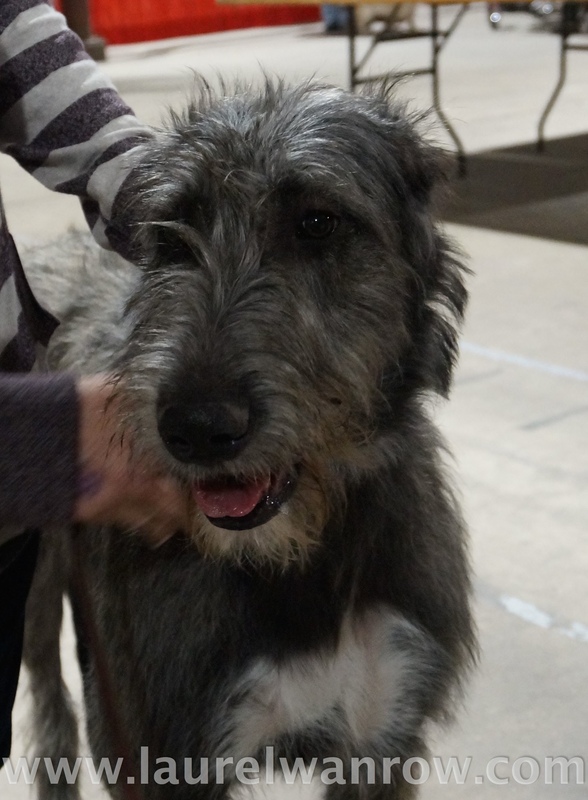 Here we go with Quinn’s first meeting and rescue of the Irish Wolfhound in my novel Passages. The last door opened into a dimly lit and mostly empty room. Two bowls sat inside, food and water. A box of dirt had been placed to one side. The surface of it was disturbed and the smell made its use obvious. The light of the hall shone almost to a mound in the back corner. It moved. I pressed Eve aside, pulling the door to protect us. The animal got slowly to its feet and stepped from the shadows. Eve’s fingers pinched into me, but the pain was nothing against the swirl of confusion surrounding the familiar animal. The big dog had been… I shut my eyes, reaching for the image. Eve released me. I grappled to dismiss my churning memories, opening my eyes to the unbelievable sight of her stroking the wiry hair of the wolfhound’s head and unlatching the chain from his collar. Dead Air—the unique curse they used on this planet. Her tone indicated something was seriously wrong. She ushered the stumbling dog toward the door of its prison. His gait was stiff and awkward, the poor beast, but he came directly to me and pressed his head against my thigh. Familiarity flooded me. Elusive threads of memory wove forward. This dog had a name, I was sure of it. The barrage of images compromised my concentration. I shook them off and dropped to a squat on the other side of the dog. “Evangeline?” I repeated. Eve massaged the dog’s thigh. He was leaning into me as much as I was leaning back. He poked his nose to mine, making a soft rumbling sound. The prickly fur, the sloppy tongue, the intelligent eyes staring steadily at me. He seemed so familiar…but why? Like in my memory, the wolfhound jerked forward, his ears perked. Footsteps sounded. Together Eve and I tripped to the threshold. I intended to close the door, but the wolfhound slipped through with a growl. “So much for hiding.” I peered around the doorjamb. The dog cantered to meet the single guard, who dropped bowls similar to the ones at our feet. The man lowered his face guard and reach for his stun sword. My appearance was enough to make him hesitate. The dog leaped. With well over a hundred pounds of force, those huge paws struck the man’s shoulders and down he went. The dog bounded on. At the top of the stairs he turned to stare, as if summoning us. We ran. The guard rolled to gain his feet. I shoved him down again and raced past. The wolfhound yipped and descended the stairs. I followed with Eve just paces behind me. Thud! Someone tripped and fell. The first chapters of Passages, a science fiction romance, are available to read here. The novel isn’t published–yet–but three author friends have SFR novels coming out in February, updates, available on Spacefreighter’s Lounge. Sorry, not sure about their dog content.